Sam McCrory, chairman of the Protestant Coalition also said that British Police in British Occupied ireland “took a very good beating and rightly so”.Mr McCrory, explicitly defended the loyalist violence on Facebook. The Protestant Coalition supported by the hardline position of the UVF’s political wing, the PUP, which condemned the rioting. This follow previous comments by another loyalist politician In a conversation on Facebook, who responded to someone else's post about an imaginary attack on a memorial parade in Castlederg in which several people including Sinn Féin figures are murdered. To which the elected politician from the leading Protestant Party the DUP replied: "We would have done a great service to Northern Ireland and the world." Unfortunately right now across most of the Irish political spectrum and the British 'intelligence' community it seems to be the only point of agreement. On Facebook on Saturday, responding to a comment, that Loyalist violence in Belfast was wrong, Mr McCrory said: “David I disagree with you regarding the word WRONG. I do believe that you should replace it with the word JUSTIFIED. As one who was on the ground throughout yesterday and evening, I witnessed the brutality of the police against men, women and children, without provocation and just to satisfy someone’s agenda. A Unionist MLA, John McCallister however last night condemned McCrory’s comments, saying “There’s no justification whatsoever for what happened in Belfast on Friday night. When I condemn the violence, there are no ifs, buts or wherefores: it was wrong. Injuring police, wrecking our image internationally, jeopardising investment, it is wrong,” McCallister also said that far from being a “victory” for unionism, as McCrory claimed, Friday’s loyalist riot had been a disaster for everyone and that the “vast majority” of people would find it “crazy” to see a riot as victory. Meanwhile MI5's spokesperson, the non elected Viceroyal Villiers has gagged the only republican who became a Minister in the Stormont Executive, despite MI5 efforts to block her. After British Secret Services, had already refused the British Prime Minister permission, to allow a public inquiry, into Britain's Secret Service murders, of an Irish journalist and two human rights lawyers, they have now gagged Culture Minister Caral Ni Chuilin from publishing the details of Britain's murder of Paddy McAdorey in Belfast in 1971, their murder of a social worker, student Michael Donnelly in 1980, and the murder of mother Sarah Larmour in 1979. Following the release of sensitive inquest documents, relating to three British murders by the British Minister Caral Ni Chuilin, emergency proceedings were issued by the Chief Constable and Viceroyal Villiers, to gag their own minister, who happens to be and Irish republican of sorts, who would not follow MI5 orders like her colleagues. Culture Minister Caral Ni Chuilin personally handed over the court files to victims' group Relatives for Justice Law firm. A decision over when the information relating to three killings stretching back more than 40 years should be given full public access has been postponed until Thursday. The two English overlords in British occupied ireland, Matt Baggott and Theresa Villiers believe sensitive details, which could identify British force members, should have been removed before circulation by their Republican minister. The Injustice Minister Ford, another sockpuppet for Britain's Secret Service MI5 said, he is "extremely disappointed" Minister Ni Chuilin had the cheek to disobey, his orders or British Secret Service's advice, before passing on the files. Minister Ni Chuilin's department is responsible for the Public Record Office where the data is held. Lawyers for Viceroyal Villiers and the British Secret Services, secured a temporary injunction or gagging order, to block their circulation. Outside the court, lawyer Niall Murphy of KRW Law, representing one of the victims family, expressed concern at the timing of the move, pointed out that the injunction prevents yet again,the material by next of kin seeking a fresh inquiry into the British murder. Mr Murphy said; "The attempt by the Secretary of State and the Chief Constable to overturn the minister's decision is a major setback to the cause of seeking to ensure the state's compliance with its positive obligations under Article 2 of the European Convention of Human Rights." Minister Ford who along with the two British overlords, is also responsible for the internment without trial of Martin Corey for more than three years, said: "I'm extremely disappointed that she doesn't seem to be taking advice from my department, the British police, and she has gone ahead and issued those documents. "There are now real fears for the life of the disobedient Minister, who is also believed to have received a severe tongue lashing, from her compromised, male colleagues, because of her disobedience to British MI5 and the big wigs of British Sinn Fein's inner circle. 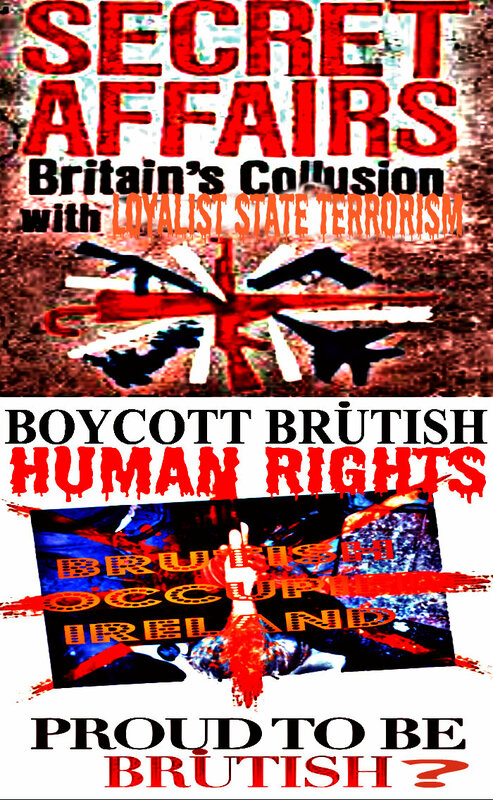 After the British State murders of Human Rights lawyers, Pat Finucane and Rosemary Nelson, along with Journalist Martin O'Hagan, with Britain's Secret Services providing the intelligence, training and mentoring loyalist agents, to shoot and bomb the lawyers, many observers are now drawing comparison, between Minister Ni Chuilin and the British Governments bombing, with specialist Secret Service equipment of Human Rights lawyer Rosemary Nelson. Many are also convinced, that it is just a question of time, before MI5 have the disobedient British Minister liquidated, by a loyalist bomb under her state carriage as a warning to any other restless natives who may be hiding in British Sinn Fein.